The largest retailers in Russia are achieving revenue and profit growth at the same time as Russian consumers are suffering from falling wages, higher prices, and loss of confidence, which has dwindled to lows not recorded for the past twenty years. How the expansion of the retail business is made possible by the squeeze of its customers is a paradox which the supermarket companies themselves, many of them publicly listed shareholding groups, don’t want to discuss in public. There’s an even more secret paradox. The biggest of the foreign retailers in Russia – Auchan, Metro, Ikea, and Kingfisher (Castorama) – are nationals of countries whose governments have gone to war with Russia, imposing the sanctions which have triggered the Russian economy’s current contraction. But in a series of interviews attempted this week in Moscow, the spokesmen for these foreign groups don’t want to acknowledge that they are profiting at the expense of their domestic rivals. What they fear, retail sector analysts say off the record, is that the Kremlin will introduce legislation to require an increase in the domestic sourcing of retailer supplies. That would be good for Russia, but bad for the German, French, Swedish and British groups. First, the big, bad news. Wage arrears – the amounts of monthly wages owed but delayed in payment by commercial companies and state entities — continue to rise. 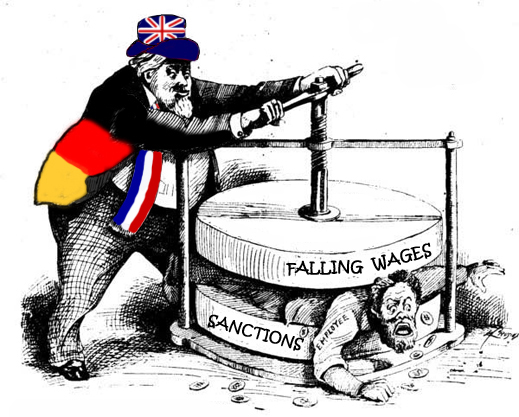 As reported by the Russian state statistics agency Rosstat, the total arrears measure in April was Rb2.95 billion, an increase over March of 2.5%. Arrears have now been rising every month this year. The March result and the wider significance of this measure can be read here. By sector, 46% of the arrears total is accounted for by manufacturing; 9% by construction; 8% by agriculture; 6% by mining. The worst affected regions are Murmansk, Crimea, St. Petersburg, Krasnoyarsk, and Nizhny Novogorod. 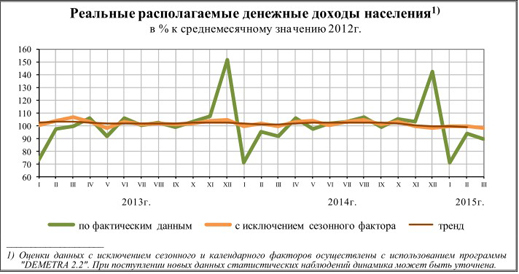 Russian consumers aren’t encouraged by the slowdown in the CPI. For one thing, it’s spring, and they know that with the season home-grown foodstuffs become more plentiful and cheap. For another, they are worried about what will happen when the harvest gives way to winter again. In surveys regularly conducted by the All-Russian Public Opinion Research Centre (VTsIOM), consumer sentiment is growing decidedly more pessimistic. Almost three-quarters of the population say the present time is unfavourable for large cash expenditures; among the poor, the proportion is 80%. Below, the first table is the response to the question, Is it a good (хорошее) or bad (плохое) time to make a big purchase. The last row, highlighted in yellow, is the overall index. The second table is the same question asked about taking a bank loan or store credit. The deterioration of consumer confidence to the March level of 26% is a historic low. The 19% index for borrowing confidence in April is also the lowest which the polling agency has recorded. Both indices are a couple of points below the lowest levels measured during the 2008-2009 crisis. VTsIOM also notes that the loss of confidence is the national consensus – the differences of opinion measured between young and old, between large-city and country people, and between high and low income earners are very small. A report by Uralsib Bank analyst Denis Vorchik, issued on May 14, shows that total volume of car sales in April were down 42% year-on-year. For the four months through April 30, the sales volume has dropped 38% compared to the same period of 2014. The government’s forecast for the rest of the year isn’t encouraging. According to the updated projection of the Ministry Economic Development, by year’s end real wages are expected to drop by more than 9%, real income by 6%. Inflation for the year could reach nearly 12%. Now hear the good news. Supermarket chain Lenta is reporting its sales revenue in the first quarter to March 30 rocketed to Rb54.5 billion; that’s 37.7% up on the same period of 2014. Because the chain opened four new hypermarkets in the quarter, the like-for-like or same-store comparison of sales revenues shows the lesser growth rate of 15%. Lenta says it now operates 136 stores which it classifies as 112 hypermarkets, plus 24 supermarkets, making a total sales area of 727,610 square metres. That metric has jumped 40% since the first quarter of 2014. Lenta is listed on the London and Moscow stock exchanges, with a current market value of $4.2 billion. Its cashflows are anchored in the British Virgin islands, the Bahamas and Cayman Islands. 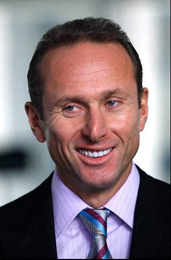 The shareholding structure is controlled by David Bonderman and the TPG Group of Texas, which owns 35.6% of the shares. The pyramid, er free float of shares amounts to 42.8%. For an analysis of Bonderman’s strategy for Lenta, read this. He has failed to preserve Lenta’s initial public offering price, but since the start of this year, the Lenta share price is up a solid 40%. Russian supermarket customers aren’t feeling encouraged, but the stock market is: Lenta, which ranks third in market capitalization behind Magnit ($26 billion) and X5 ($6 billion), isn’t alone. The other major supermarket or network retailers are showing strong year-to-date gains in share value, ranging from 68.4% for X5 to 26.5% for Dixy (market cap $1.1 billion) and 25.8% for Magnit. O’Key is the exception, with a year-to-date decline so far of 26.8%; its market cap is $875 million. O’Key’s weakness has been explained in a recent Fitch Ratings report as the result of the “cannibalization effect” — most of its new stores were opened in the same cities where the company already has outlets. In addition, O’Key suffered more than its peers from the impact of sanctions and Russia’s ban on European and American food imports, reducing its product range and cutting numbers of customers. Specialized retailers have shown mixed trends. 36.6, the pharmacy group, started the year at Rb12.77, shot up to Rb21.80 in mid-February, and is now at Rb15.84, with a year-to-date increase of 24%. Rosinter, the fast-food restaurant chain, started at Rb94.40 and is now trading at Rb87.10, down 8%. The London-listed Russian food producers are doing well, too. Cherkizovo (meat) hit bottom in mid-January at $6.30 and has moved up steadily to hit peak last week at $10.95, before falling back to $9.95 – this is a year-to-date rate of 58%. Rusagro (sugar, meat) has been steadier – up 62%. For background on the pork sector, see. The picture for Moscow-listed wine producer Abrau-Durso is no longer as rosy as it was. The first-quarter dynamics for the supermarket groups are for revenues to be increasing, but for the rate of growth to be decelerating. Much of this trend parallels the effect of inflation and rouble value. For example, Magnit has reported month-on-month sales in March grew by 30.4%; in February 35.3%; in January 34%. Measures for average check, number of new stores, and total retail space are also growing, but as time goes along, at a slower pace. In the first quarter of 2015, Magnit says its total retail space grew by 496,000 square metres compared to Q1 2014. How to explain the paradoxical gains of the retailers and the losses of their customers? Part of the answer is that market pessimism about the impact of the Ukraine conflict, sanctions, and the US war for regime change in Russia pushed share values to their nadir in January. Since then the market perception is that things aren’t going to be as bad as they looked in January. The Russian consumer perception is that they are worse. Industry analysts report that patriotic marketing campaigns are having positive impact. In Moscow and other towns, the city and district administrations are stimulating farmers’ markets with low fixed charges for sales at low prices of domestic produce. This, plus price jawboning by the Kremlin and price control measures by the government, are curtailing inflation and sustaining consumption, albeit at lower income levels. This process in turn represents a price cap pressure which the established retailers are managing with greater or lesser flexibility. The impact of the price controls introduced so far is limited because they are targeted on the most socially sensitive or staple goods. For these the profit margin in retail was already small. 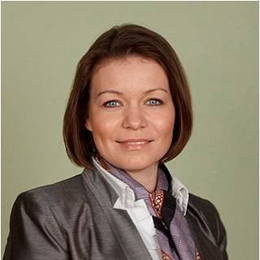 Sector analysts agree that the Russian market has been characterized by a relatively lower proportion of market concentration by the big players compared to the European or US markets. 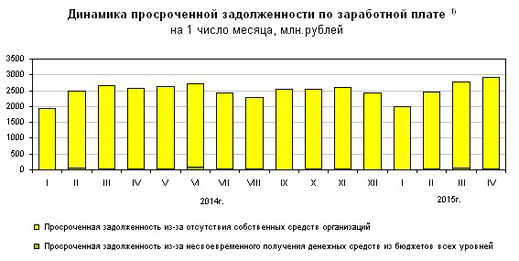 For instance, the share of turnover for the top-5 retailers in the Russian market is about 20%. But in the US, it’s 45%; in Germany 69%. Analysts interviewed for this report are predicting there will be a to 10-point increase in market share for the top-5 retailers over the next two years if the current external conditions, including sanctions, remain unchanged. At X5, Mikhail Fridman’s (above, right) Alfa Group holds the control stake of 48%. But Fridman and the minority Pyaterochka shareholders with 14.4% have reportedly wanted to sell if they could find a buyer at their price. Earlier deal attempts with Carrefour and Walmart failed when X5’s market capitalization was approaching $13 billion. By January of this year, it was down to $2.7 billion. Since then there has been a recovery, but late in April and early this month sellers started outnumbering buyers. The freefloating shareholders of X5 hold 38%. At Dixy, Igor Kesaev (right) controls 54.4% through his Mercury Group; the free float is 45.6%. In March 2013 Kesaev and his men told the market they would consider selling shares “as [Dixy’s] market value grows to help boost liquidity and reduce debt.” Since then Dixy collapsed to half its value last year. Its recovery to a current market cap of Rb59 billion, still leaves Dixy and Kesaev worth less than they did two years ago and owing almost as much. Dixy’s debt was Rb28.9 billion in 2013; it’s Rb27.8 billion as of December 31, 2014. 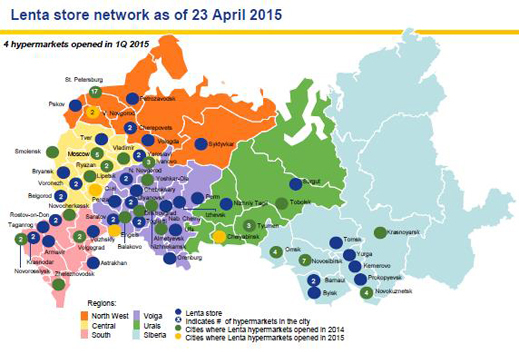 The big foreign retailers in Russia are Auchan of France, Metro of Germany, Kingfisher of the UK (trading as Castorama and Leroy Merlin); and Ikea of Sweden. Carrefour of France, which is bigger globally, was in the Russian market but sold out after failing to take over the Seventh Continent supermarket chain. 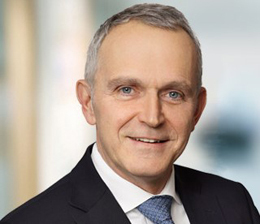 Again on a global basis, and across Europe, Auchan, Metro, Kingfisher and Carrefour have all reported downturns in sales, earnings and profits in 2014. Ikea was the exception, with higher sales revenue and higher profits. The foreign majors are extremely secretive about their financial performance in Russia, especially now. Publicly, Auchan says things like this in its report for 2013: “rapid and profitable development in Russia exemplifies the Group’s policy… Russia had a more difficult year, although its growth potential remains high.” In 2014, Auchan reports what in Russia it called a “complex geopolitical situation”. But asked to compare the 2014 with the 2013 results in Russia, and the first quarter of 2015, Maria Kurnosova (right), an Auchan spokesman in Moscow, said the company only announces store openings – sales, earnings and profit figures aren’t disclosed. Auchan’s Russian secrets were briefly penetrated five years ago, when a fight with the tax authorities led a Moscow court to order Auchan to disclose the financial details of its Russian operations in 2009 and 2010. These revealed that in sales Auchan was running second in the retail market behind X5, and ahead of Magnit. With a gross margin of 20% Auchan’s profitability was trailing X5 (24.4%) and Magnit (23.3%). Ikea, privately owned like Auchan, keeps its Russian financials secret. It does reveal, though, that the Russian market is the company’s fourth priority globally; that’s to say, its revenue-generating capacity is just behind Germany, US and France, and ahead of the UK. 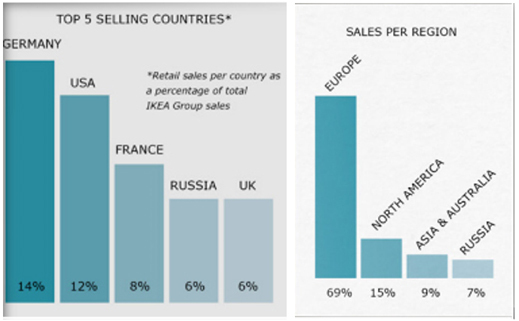 Ikea’s annual report for 2014 also reveals that the fastest growing country markets for the group were China, Russia and Hungary – in that order. 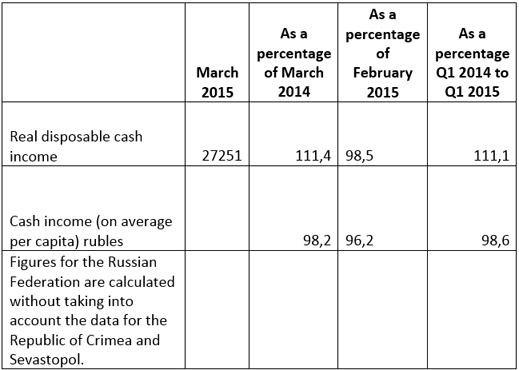 OBI’s Russian secret can be found, for 2013, in this table in the Tengelmann report. With just 8.2% of OBI’s sales space, and 5.3% of OBI’s stores, the Russian sales number amounted to 21% of the revenues. They were also the only growing number in OBI’s global operations, compared to the negative ones in the rest of Europe. As the Russian market contracts, there are opportunities for the internationals to expand their market share, as well as to buy up assets on the cheap. But there are also risks. 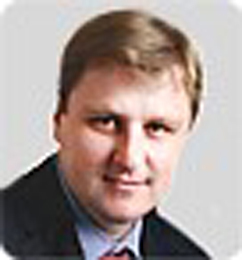 Belov of Uralsib is predicting that both the internationals and the top-5 Russian retailers will expand their market share at the expense of the failing smaller shops; he doesn’t expect they will take market share from each other. But will the larger capitalization of the foreign retailers, and their freer access to cheap money, result in the internationals attempting to take over one of the top-5 Russians?